Three quarters of a century ago the celebrated syndicalist manifesto The Miners’ Next Step was published. Written by a group of young socialists from the Rhondda, nearly all of whom were themselves working miners, the pamphlet occupies a prominent place in the revolutionary traditions of the British labour movement. Rejecting the conventional reformist aim of securing state ownership of the mining industry through parliamentary legislation, the authors of The Miners’ Next Step proposed to reconstruct their union as a revolutionary industrial organisation, directly controlled by the rank and file, which through an uncompromising pursuit of the class struggle would become powerful enough to take over the collieries and oust the coalowners. This programme found an enthusiastic response throughout the British coalfield among militant mineworkers who were opposed to the industrial pacifism of their union leaders and disillusioned with the performance of the Labour representatives in parliament. Indeed, the strategy outlined in The Miners’ Next Step was to dominate the outlook of revolutionaries in the coalmining industry for a whole period up to and beyond the formation of the Communist Party. The publication of The Miners’ Next Step provided dramatic evidence of the transformation that had taken place among the South Wales miners since the late 19th century, when they had acquired a reputation as among the most backward in Britain from the standpoint of labour organisation and class consciousness. The breaking of the Amalgamated Association of Miners in 1875, after a series of intense disputes, had resulted in the imposition of the sliding scale system, whereby miners’ wages were automatically regulated by fluctuations in the selling price of coal. No coalfield-wide union existed in South Wales for over two decades after this, and the few local organisations were mostly little more than company unions. The then dominant figure among the miners was William Abraham (known as Mabon), a staunch advocate of co-operation with the coalowners, with many of whom he shared Welsh nationality, Liberal politics and a nonconformist religion that preached the harmony of classes. When the Miners Federation of Great Britain (MFGB) was founded in 1889, on a policy of fighting the sliding scale, Mabon’s opposition ensured that the MFGB gained no more than a small foothold in the South Wales coalfield. The subsequent eclipse of Mabon’s authority, and of the social philosophy he represented, was the outcome of a complex process involving the waning influence of Liberalism and nonconformity over the miners and the dilution of a distinctly Welsh culture by large-scale immigration. But the underlying factor was the economic changes taking place in the South Wales coal industry. A major turning point was the great strike of 1898, in which the South Wales miners did battle against a sliding scale system that had failed to give then a living wage. Their eventual defeat at the end of a six-month struggle, rather than leading to demoralisation, made clear the need for stronger organisation. In September 1898 the various local unions therefore came together to form the South Wales Miners Federation (SWMF), which affiliated to the MFGB a few months later. After a vigorous recruitment campaign the SWMF successfully established itself in the coalfield and in 1903 finally put and end to the sliding scale. The opening years of the new century saw an increasing embitterment of industrial relations as productivity, which had always been low in South Wales due to difficult geological conditions, continued to decline with the exhaustion of the richer and more accessible seams. Constrained from raising prices by competition on the overseas markets where a high proportion of South Wales coal went for sale, the owners maintained their profits by cutting labour costs, with the main pressure falling on miners’ wages. For their part, the SWMF rank and file angrily resisted attempts to reduce their earnings, the purchasing power of which was already being eroded by a steep rise in the cost of living. How things had changed, a local paper commented in 1909, since the days when "it was accepted almost as an axiom that the interests of Capital arid Labour were identical. Today that statement would raise a laugh of derision". The period was also marked by a tendency towards the concentration of ownership in the South Wales coal industry, the most notorious example of this being the expansion of the Cambrian Combine, which under the directorship of D.A. Thomas absorbed a succession of local collieries until by 1910 it employed a total workforce of 12,000 in the mid-Rhondda. It was large companies like this which headed the drive to reduce labour costs. They were able to rely on the support of the Monmouthshire and South Wales Coalowners Association (M&SWCA), which provided financial backing for individual cornmpanies to impose lock-outs as a disciplinary measure against recalcitrant workers. In contrast to the organised power of capital, the SWMF was a federation of autonomous districts, a form of organisation that obstructed united action against the coalowners’ offensive. The miners’ position was further weakened by their leaders’ support for the conciliation system which had replaced the sliding scale. Based on a Conciliation Board composed of union officials and employers’ representatives with a supposedly independent chairman, its purpose was the regulation of wages through peaceful negotiation. It enabled Mabon to preserve the cosy relationship with the coalowners that he had enjoyed during the sliding scale period, while others found their former militancy smothered by participation in the conciliation machinery. This leadership faced mounting opposition from a rank and file demanding a more aggressive response to the owners’ attacks. "Napoleon once said that lambs will be led by a lion but lions will never be led by a lamb", one angry miner declared in 1909 after his district official had negotiated a compromise deal with the employers. "It is better to be without leaders than have a lamb at the head who won’t lead." The SWMF bureaucracy’s industrial moderation found its political equivalent in their continued adherence to Liberalism. The four SWMF MPs who took their seats after the 1906 general election – these included Mabon, William Brace and Tom Richards, respectively the president, vice-president and secretary of the union – refused to join the Labour Party, and in defiance of a coalfield baIIot supporting Labour Party affiliation they remained as part of the trade union group in the Liberal Party until the MFGB as a whole transferred its allegiance to Labour in 1909. The campaign to break the SWMF from Liberalism was led by members of the Independent Labour Party (ILP), which had been a significant influence in the coalfield since the 1898 strike, one of its achievements being the election of Keir Hardie as MP for Merthyr in 1900. The ILP’s policy of independent political action attracted to its ranks a number of SWMF militants, notably several of those later to co-author The Miners’ Next Step, who during 1906-9 held prominent positions in the party’s Rhondda organisation. The assertion of their independent class interests inevitably brought miners into conflict with the chapel. 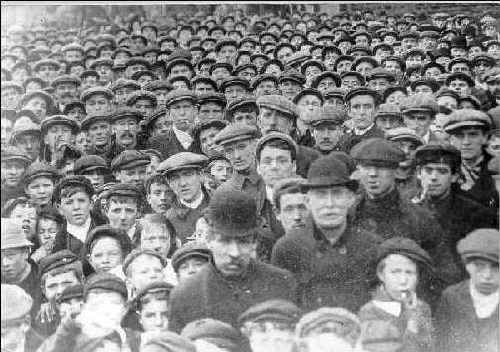 Welsh nonconformity identified the source of working class poverty not in the pursuit of profit by the employers, many of whom were respected members of chapel, but in the sinful lives – most especially, the intemperance – of the workers themselves. The solution was to be found along the path of personal redemption, the chapel insisted, not through collective class action. The great religious revival of 1904-5 itself represented something in the nature of a popular revolt against the alienation of the nonconformist hierarchy from the lives and problems of the working class. And after the revival proved incapable of effecting any real change in social conditions many young miners who had been active in the movement looked instead to political action, with a consequent expansion of the ILP. Some of these new recruits to socialism began to find their way towards a materialist outlook, but even those who retained their Christian faith were confronted by the hostility of a chapel establishment that was closely associated with the Liberal Party. When the future MFGB general secretary A.J. Cook, for example, attempted to continue his work as a Baptist lay preacher after joining the Porth ILP in 1906, he came under strong criticism for taking up social issues in his sermons and was forced to resign from the chapel. By such actions nonconformity exposed its fundamental class allegiance, and its hold over the minds of militant miners was correspondingly diminished. This article was intended to be the first part of a series of articles on the history of syndicalism in South Wales up to and including the formation of the CPGB. However, as no-one was interested in publishing it, no further articles were written. I'm trying to found out more about A.J. Cook. Does anybody know much more about him? I came across his name before as a contributor to Barrett's paper Anarchist, in 1912. Its a shame that you couldn't find a publisher for a series of articles. A leader implies...some men who are being led...self-respect which comes from expressed manhood, is taken from the men and consolidated in their leader...the order and system he maintains is based on the suppression of the men, from being independent thinkers into being "the men " or "the mob"
I'm trying to found out more about A.J. Cook. Does anybody know much more about him? The miners were led by the famous A.J.Cook, the "revolutionary" leader of the Miners Federation (the forerunner of the NUM), the first miners' Arthur, whose image is as much a legend as the King some people have treated him as. A.J. Cook was undoubtedly a good passionate speaker. Though he was paid as a Union official, he was never a full-time bureaucrat; he worked alongside the miners he represented - all of which is why he was uncritically supported by the vast majority of the miners of his time. But he was very much an expression of the weakness of the old workers movement, and believed, amongst other things, in professional paid leadership and whose idea of justice for miners was simply nationalisation. Moreover, he insisted that miners weren't lazy and that they were not saboteurs (see The Case For The Miners , written by Cook, pubd. 1924). It's very much part of the schizoid leadership role within this society, especially within trade unionism, to present a 'reasonable' (reformist) image to the general public, whilst rabble rousing to your followers. He was briefly a member of the CP, having left in 1921, probably because being a CP member would have prevented him from being elected as miners leader (according to Paul Foot, anyway). Certainly there was nothing particularly principled about his departure and, unlike for example Sylvia Pankhurst or Anton Pannekoek, he never incurred the wrath of the international or national CP, and indeed was praised after his death by Arthur Horner (the leading Stalinist miner's bureaucrat who insured that the miners buckled down to the State as boss of the new nationalised mining industry after World War ll). He remained a member of the ILP (one of the best of the old workers' movement parties), but was never one of the more independent-minded members. As for nationalisation, in Britain at least, nationalisation was never considered a particularly socialist, let alone radical, idea. The Sankey Commission into the mining industry which published its findings in 1919, recommended "nationalisation or a method of unification by national purchase and/or join control" . This Commission included a Tory member of the government – Andrew Bonar Law, who later became Prime Minister for a short time. Undoubtedly this recommendation came as a verbal sop to the workers movement which, in the wake of the October Revolution in Russia, was growing more confident. The Miners Federation accepted the Sankey Commission's findings without question, which shows how easily recuperated the British workers movement was at this moment. Of course, its findings weren't put into effect until almost 30 years later. Regardless of its words, in practice the British ruling class rarely makes concessions of any significance until well after the social pressures to make concessions have receded. It doesn't like to be seen to be giving in. Shortly before the General Strike, a different Royal Commission – the Samuel Commission – reported recommendations which were a retreat from the suggestion of full nationalisation, suggesting only that coal royalties be nationalised, recommending the continuation of private ownership with a few minor concessions thrown in – pit head baths, and improved government aid for research and distribution. Despite the fact that it suggested immediate consideration be given to the lowering of wages (some months into the miners strike, but after the defeat of the General Strike) the great radical A.J.Cook said the miners would accept its findings. But even then, the mine owners, the balance of class forces having been firmly tipped in their favour, refused to accept even its very minor concessions. Which just goes to show that, even on the level of ideas, to concede anything to the dominant powers will, rightly, be taken as a sign of weakness, and, as is the case when confronted with mad dogs, only encourages further attacks. While of significance, the drafters very much refused to give up hope on parlimentry action. Of course, we can certainly attribute this to their marxian socialist and even De Leonist leanings. And, while a powerful document, and powerful events surrounding it, the parlimentary door allows for the espcape from direct action. gave up hope in engaging on a political and party level, be it socialist labor or bolshevik. Political action must go on side by side with industrial action. Such measures as the Mines Bill, Workmen's Compensation Acts, proposals for nationalising the Mines, etc., demand the presence in Parliament of men who directly represent, and are amenable to, the wishes and instructions of the workmen. While, the eagerness of Governments, to become a bludgeoning bully on behalf of the employers, could be somewhat restrained by the presence of men who were prepared to act in a courageous fashion.